Provided by Samantha Elenich In a portrait taken at last year’s Old-Fashioned Christmas in Chassell, Mr. and Mrs. Claus are seen ready to greet kids both young and old. The Old Fashioned Christmas in Chassell is returning this year, with events starting Friday afternoon through Saturday. Chassell School invites the public to its elementary Christmas program at 1 p.m. Saturday, while the weekend kickoff event comes later that evening. “Santa Claus comes and lights the tree,” organizer Barbara Wells said. At 5:30 p.m. on Hamar Field, Santa Claus will light the tree and lead the group in singing Christmas carols. Afterward, the Chassell Women’s Club will provide homemade cookies and hot chocolate for the carolers. On Saturday, events start at 10 a.m. with the Holiday Handcrafts Bazaar in the Chassell School. “They line the entire gym and the hallway, too,” organizer Samantha Elenich said. The Keweenaw Kountry Store is offering free coffee and pastries 10 a.m. -5:30 p.m. 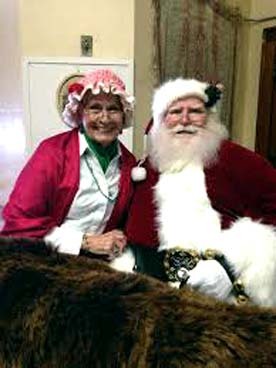 The Chassell VFW home is hosting a children’s games and story hour at 10 a.m.
At 11 a.m., Santa returns to Chassell with Mrs. Claus at the Chassell Heritage Center to visit with children. Before or after visiting Santa, children can decorate their own cookies for free. Beginning at noon on Saturday, the Home For the Holidays house tour and tasting gives people a chance to visit decorated homes in the community. “There’s food and drinks at each stop,” Elenich said. Area restaurants and stores cater snacks for the visitors. Tickets are $10 each and are available at the Chassell General Store, Chassell Heritage Center, the Grooming Zoo of Chassell, the Keweenaw Chamber of Commerce in Houghton, and the Keweenaw Convention and Visitors Bureau in Calumet. For more information, contact Smantha Elenich, 906-231-0723 or elenichs@gmail.com.